One of the most enjoyable aspects of dog ownership is walking with your pooch on a fine summer’s day. However, many people tend to forget the many risks that a summer’s day can bring to a dog – especially his paws. Dogs’ pads are durable, they have evolved over the centuries to need to preserve the hard leather type skin on the base of their paws, and softer skin simply wouldn’t suffice. However, pads can still be seriously damaged and when they are this brings agony to a dog, prevents them from walking, feeding, drinking and can contribute to serious ill-health. Think of stubbing your toe, standing on something sharp – it hurts! This is no different for your dog. When we go for a walk and the sun is out we protect our feet with sandals, flip-flops or shoes as second nature, yet when we’re taking our dog we clip on the leash and go on our way, without a thought for their poor feet! Pavements, especially tar-coated asphalts get unbearably hot in the summer (hot enough to fry an egg sometimes) and when we consider this it seems barbaric to walk our dog on them. If a dog’s pad does become burnt this will show in different ways to other injuries such as lacerations or infections and sometimes can remain invisible to the eye. It’s also very important to consider this if you are walking a new puppy that has very tender paw pads. Remember if you take your dog to the beach for an outing – that hot sand can burn too! 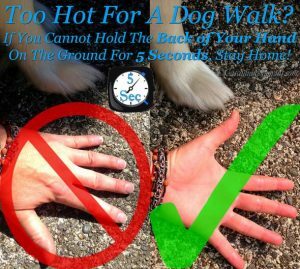 Stick to the five-second rule – if you can’t hold the back of your hand on the asphalt or pavement for at least five seconds, it’s too hot to walk your dog. So, how do you know if your dog’s pads are burnt? You must keep the area clean and cool, as soon as you spot the problem gently press the area with a cool compress, you could also move your dog to a patch of grass in a shady area. Once you have immediately treated the pad at home, you must then seek treatment from your veterinarian; this could be with antibiotics or proving you with advice on how to treat the pad at home. Remember, prevention is better than cure. If the heat of the day is hotter than average or if you’re planning a long walk then it may be kinder to keep your dog at home unless you can de-route to shaded areas such as woodlands, or a walk totally on a grassed area. My dog walking services always start and finish at your home and because we are very lucky here in North London my dog walking services do not involve transporting the dogs in a van (which is even hotter) and we usually close to woodlands such as the Brook, Highgate Woods, Coldfall woods and the more shaded areas.